CONCORD, NC — The AAPCO Group showed up at the 2008 NAA Education Conference & Exposition, June 26-28, with a number of new items that had attendees talking and excited — not the least of which was a new name. Formerly known as AAPCO Southeast, the company displayed a new logo and a sharp new tradeshow booth that immediately demonstrated capabilities and services to attendees at a glance. "Response to the new name, logo and trade show booth was very positive," said Skip Huddleston, Senior VP of Sales and Marketing for AAPCO Group. "We wanted our new name to be more indicative of the markets we serve, and we wanted our new booth to be a dramatic display of our services. It looks like we accomplished that." 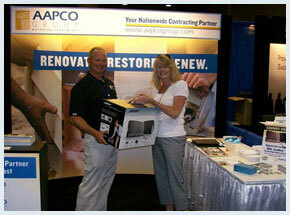 The new name wasn't the only excitement at the AAPCO Group booth, though. The company also offered attendees the chance to sign up to win a BOSE® SoundDock® Digital Music System. The winner of the system was Bonnie Moser, a Regional Director with Drucker & Falk, LLC located in Raleigh, North Carolina. To say she was excited to win might be an understatement. "I feel like it's Christmas!" Moser exclaimed. An air of excitement surrounded the show from the beginning as opening speaker Colin Powell, retired General U.S. Army General and former U.S. Secretary of State under President George W. Bush, took the podium. Powell's speech was described as humorous while also being inspiring and motivational. AAPCO Group attendees at the show included Huddleston and President Stan Dobner from AAPCO Group corporate offices; Travis Couick; VP of Sales and Marketing from AAPCO Southeast; Ron Boyette, Regional VP Operations of AAPCO Florida; and Russell Camper, Regional Director of AAPCO Mid-Atlantic. "It was a great show for us," stated Huddleston. "We made numerous contacts with exciting new clients, as well as getting a chance to visit with a large number of our existing clients."